No kitchen is complete without a cook's knife, and this impeccably designed Global 20cm Cooks Knife is sure to get plenty of use. 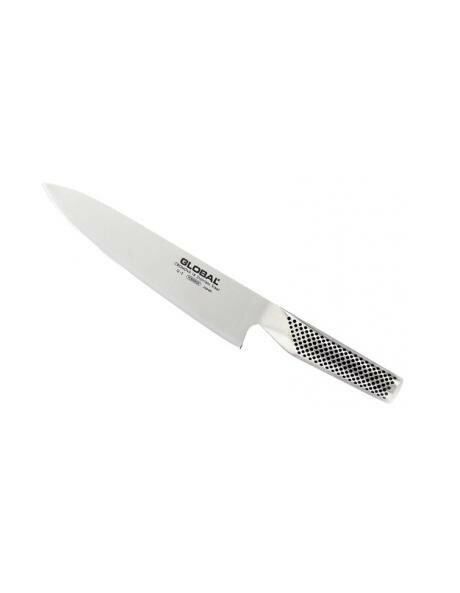 Its 20cm blade makes the knife excellent for slicing and dicing everything from small vegetables to huge chunks of meat. Like all Global knives, this one features unrelenting quality and durability. Its blade boasts double-tempered CrMova 18 stainless steel, which maintains longlasting edge sharpness. The knife stays firmly in your grasp, thanks to the dimpled patterning that adorns its hollow, stainless steel handle. A seamless design makes this knife exceptionally hygienic as well. Start chopping, slicing and dicing like a professional by ordering this cook's knife today!